Our first week of quilting! 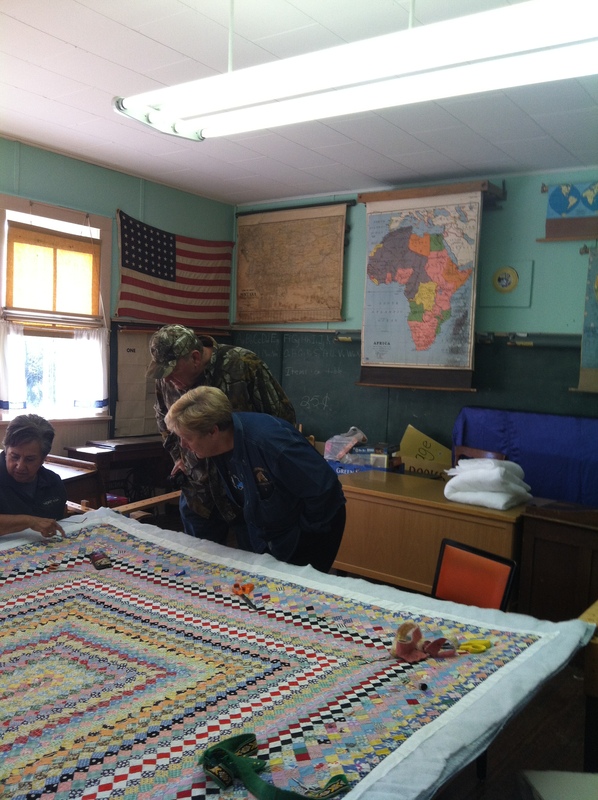 It is such a joy to be back with these women gathered round the quilting frame. We are doing one that I believe was made by Lynda’s husband’s grandmother. Lovely small pieces referred to as a ‘postage stamp’ quilt. And the quilting pattern we are doing isn’t all that difficult. Needless to say with this group of remarkable women – they throw themselves into the winter season starting up for us again. This coming Friday we will have a potluck luncheon. Cathy is beginning to plan our annual performance cooking for the Tobacco Valley Community Soup Night in November. And there is talk about what we should each make for the holiday bazaar. In most situations I would find this growing list a tad overwhelming but with these women I have no doubt it will all fall smoothly into place. The weather is cooler and the larch are beginning to turn gold. Our first frost is predicted this week sometime. There is ease in getting back into our Friday quilting schedule with Joan’s coffee, Cathy’s stories and Bev’s jokes. And as always, we get visitors stopping by. This week it was a couple from Michigan who marveled at what we did. I wondered if they felt as though they had wandered into a time warp. There we sat around a frame sewing by hand in an old school room. The man asked if he could take our picture. I asked if I could take his which was a great reminder for me to start writing this blog again.